There's nothing like solving a problem all by yourself, but everyone needs help once in a while. We've put together a list of frequently asked questions to help you with common problems. If you're still having trouble, feel free to contact us using the link at the top of the page. Before you can record you must be logged into the secure part of the Vidih web site. 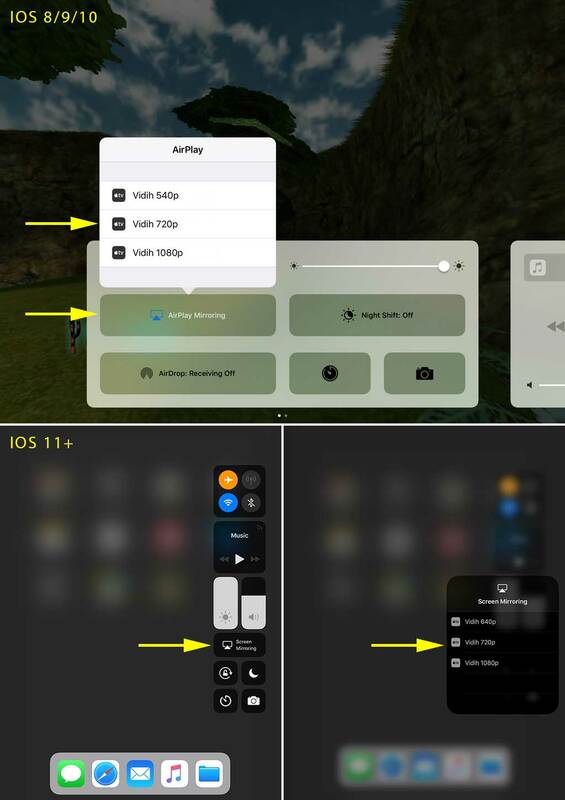 Once logged in, to start recording simply swipe up from the bottom of the screen to show the control panel, then select 'Screen Mirroring' (or 'AirPlay Mirroring' if you are on iOS 8, 9 or 10) and finally the resolution you would like to record in. 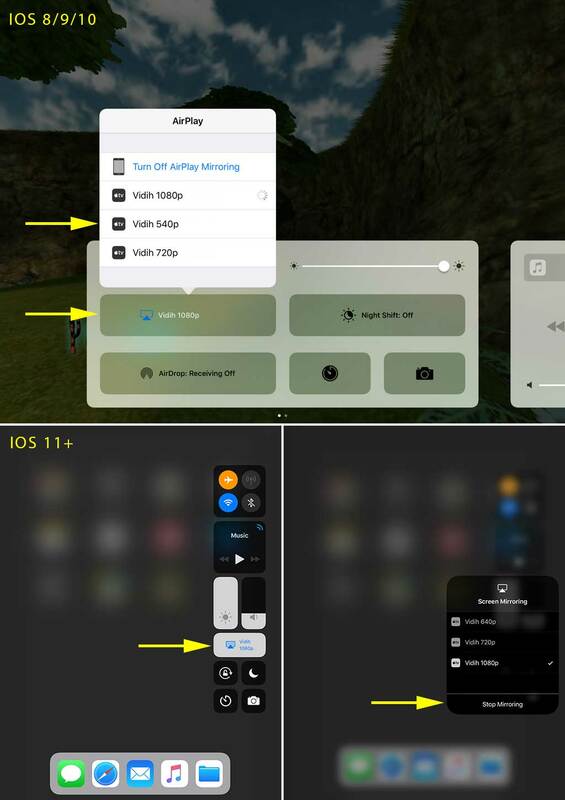 To stop recording swipe up from the bottom of the screen to show the control panel, then select 'Stop Mirroring' (or 'Turn Off AirPlay Mirroring' if you are on iOS 8, 9 or 10). How do I view and download my videos? Return to Safari and your recorded videos are displayed ready to preview, download, rotate or delete right from inside the browser. How do you pronounce Vidih? We get this question a lot! It's pronounced with a silent 'h' so more like 'vidi'. How do I livestream to YouTube Live, Twitch or Facebook Live? Tap the relevant tab on the top of the home page - eg YouTube. Then tap 'Configure' to retrieve your stream information from the social media channel. 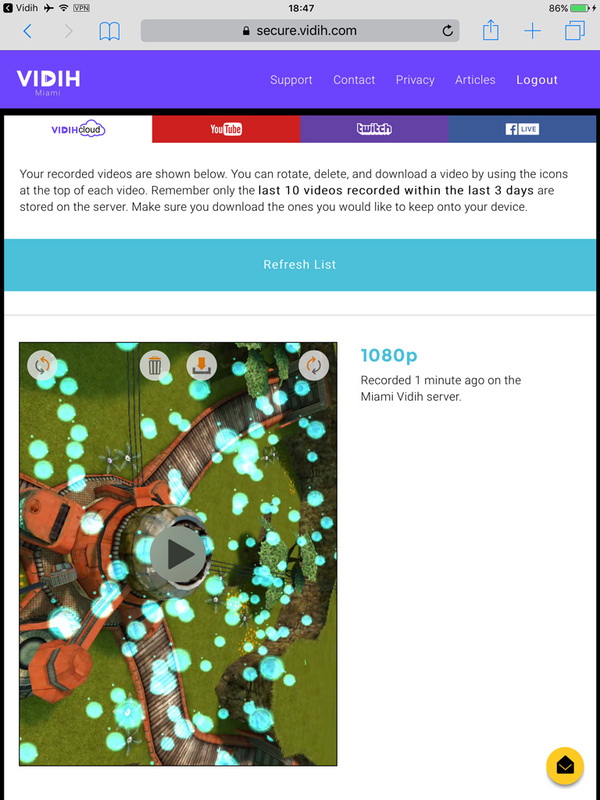 Then simply start/stop AirPlay to our Vidih servers to start/stop live streaming. Why can't I hear any sound from the device while capturing? Due to Airplay limitations on iOS you can not capture device audio and listen to it on the device at the same time. Although you will not hear the sound while capturing rest assured it will be in the recording or livestream. How can I record from the Mic while I capture? By default Vidih does not capture from the Mic, however you may use the free Mic app to redirect the Mic into AirPlay. To start Mic capture, connect to a Vidih AirPlay server and then run the Mic App. To stop capture, simply close the Mic App. The Mic does not work or cuts out? When other apps change the sound configuration on your device they can disconnect the Mic program in the process. You should make sure the Mic program is the very last program you open i.e. start AirPlay, start any App or Game you want to record and only then open the Mic app. How can I record a voiceover or video overlay over my capture? The Vidih iOS app (available on the App Store) allows you to record voiceovers and video overlays. Recording your voice at the same time as capturing is on our roadmap and will be available soon. Why is there a VPN icon at the top of my screen? The Vidih service uses a VPN to enable secure access to our internal network where the Vidih capture devices are located. The icon is displayed while you are connected to our network. The VPN profile also doubles as a login so you don't need to remember any login and password details. NOTE: the VPN only routes traffic destined for the Vidih capture devices through our network, all other traffic is routed normally by your device and never enters the VPN. How do I turn the VPN off when I'm done? Simply tap the 'Logout' link at the top of the page and the VPN will disconnect. Which locations in the world does Vidih have servers? I have a question that isn't in the FAQ. Please use the link at the top of the page to contact us with your question.